In order to more thoroughly evaluate Dharma’s heart rhythm at home, we performed a 24 hour Holter monitor recording. This study showed the presence of advanced second degree AV block with a minimum heart rate of 30 beats per minute. The picture shows a representative portion of Dharma’s Holter recording. The red arrows indicate blocked P waves. The pause associated with the two consecutive blocked P waves was greater that 3 seconds in duration. Advanced second degree AV block is likely a progressive condition that carries a high risk for the patient. Many patients affected by this conduction disorder progress to complete heart block (third-degree AV block). 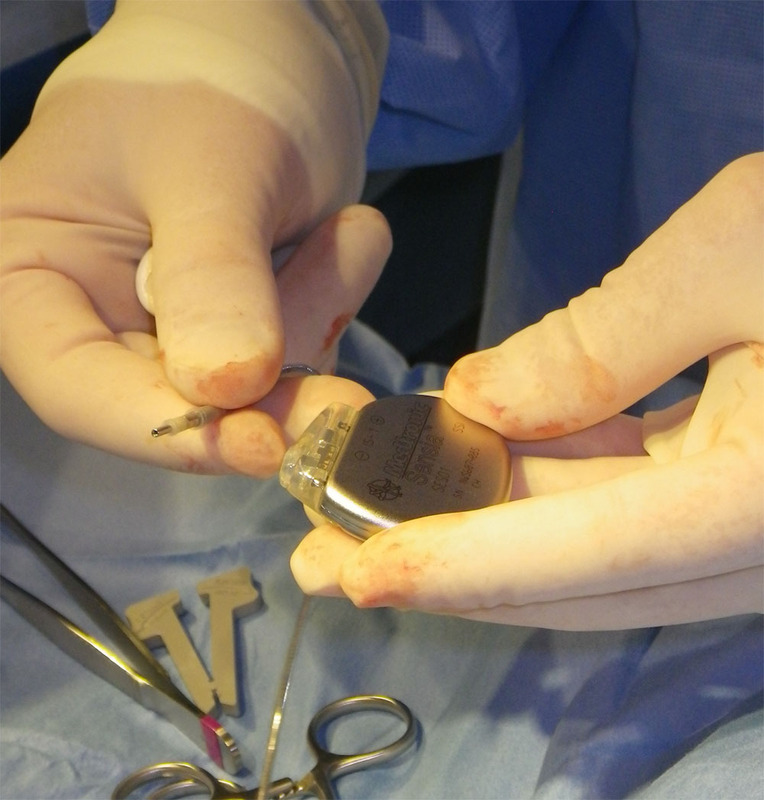 Implantation of an artificial permanent pacemaker is the treatment of choice. 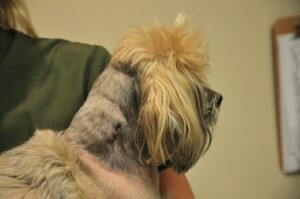 Dharma was hospitalized the day prior to the procedure. The day of the procedure we placed two adhesive electrodes on her chest to be able to artificially pace her after induction of anesthesia in case her heart rate dropped. 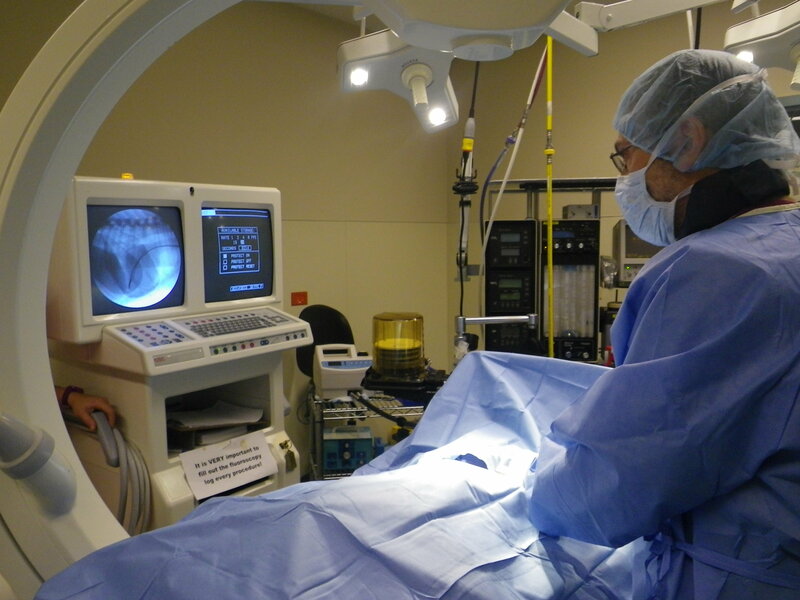 Dharma’s surgery went very well and our anesthesiologist, Dr Craig Mosley was pleased with her anesthesia recovery. The pacemaker was programmed to sense Dharma’s intrinsic heart beats and start pacing when the heart rate approaches 80 beats per minute. Dharma was monitored overnight in the ICU and discharged to the care of the owners the day after the procedure. The picture shows two consecutive sinus beats followed by a blocked P wave (red arrow). This pause in the ventricular rhythm triggers the pacemaker that starts pacing the ventricles at a heart rate of 80 BPM (blue arrows), until a sinus-initiated QRS complex is sensed by the pacemaker (black arrow). Sutures were removed 9 days later and a brief recheck two weeks after the surgery showed that Dharma was healing well. Pacemaker recipients are routinely rechecked one month after the procedure. The first week of January Dharma’s pacemaker was interrogated and re-programmed with a special computer via a radio frequency “wand” placed on the patient’s skin. Modern pacemakers collect and store data that is used to optimize the settings of the device with the intention of maximizing the patient’s quality of life and device battery duration. Dharma’s case highlights the diagnostic value of a Holter monitor recording in patients affected by conduction abnormalities. This case reminds us that also relatively asymptomatic patients at high risk for progression of their conduction disorders are candidates for pacemaker implantation.